I do not celebrate the Deipnon exactly when most of my co-religionists do, which was last night. This is due to my stubborn insistence to hold onto this one last remaining vestige of the modern calendar in my practice. When I began this path and learned about monthly observances, I began them on the first of each standard month. That convenience was necessary for me to advance in my practice at all, but eventually I started paying attention to the phase of the moon instead. (I still wouldn’t be able to tell you the ancient Athenian name for the current month if my life depended upon it, at least without my smart phone.) I have yet to adapt to starting days at sundown rather than midnight, which is why I celebrated the Deipnon today. Most months, I get together some appropriate foodstuffs to offer Hekate, and then I prepare chocolate chip cookies for Noumenia. 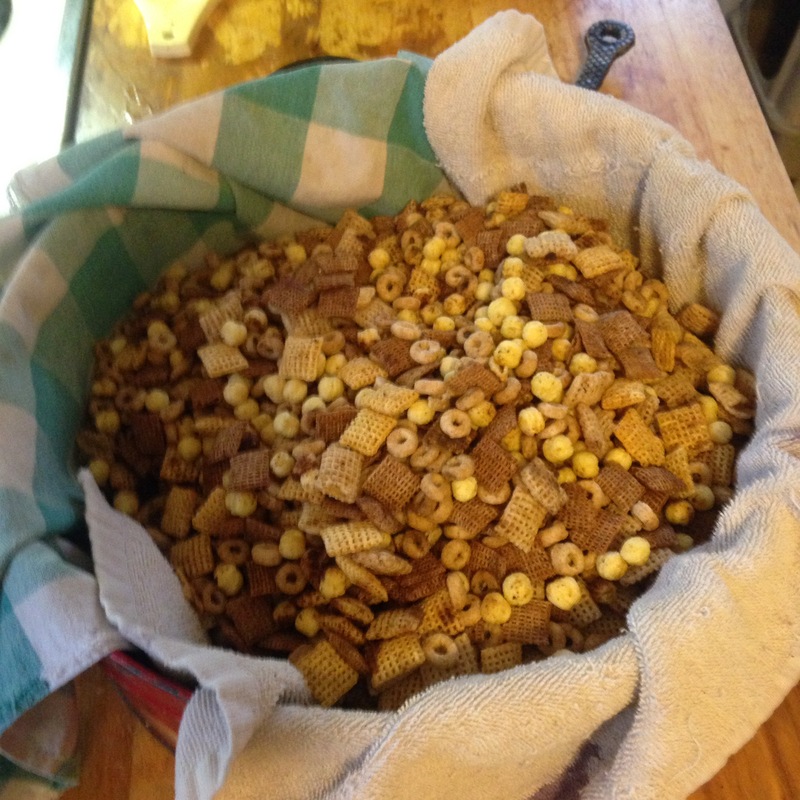 This month the timing worked out that I was due to make favorite snack, one which I only prepare during the last week of the year: special snack, we called it in my childhood; a slightly modified recipe of Chex mix. 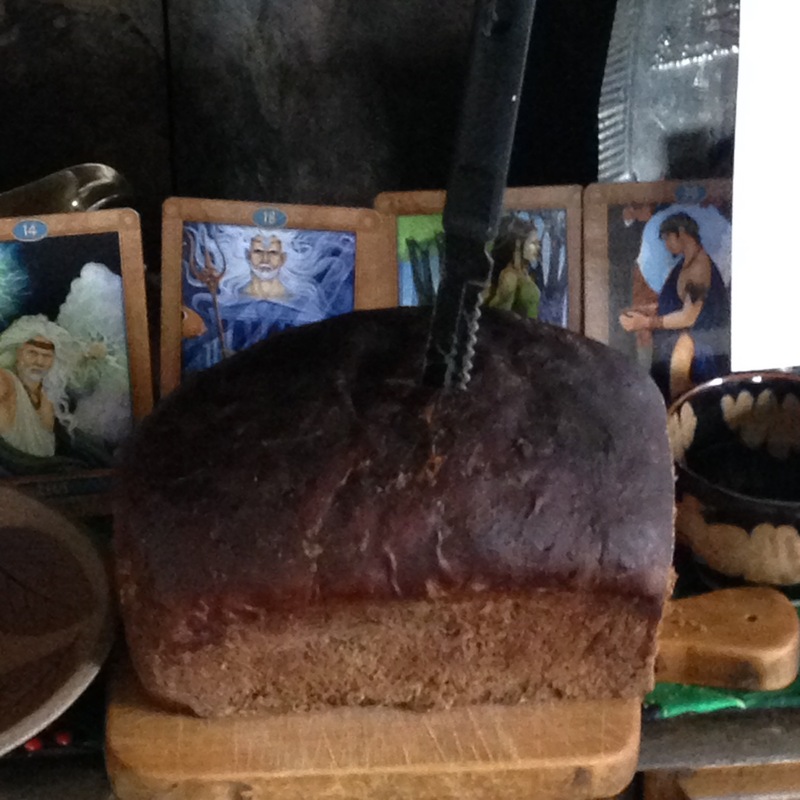 Since the recipe was handed down to me by my late father, and it includes essence of onions which are fairly common in offerings to Hekate, I opted to make it the offering instead. Incense plays a cyclical role in my devotions. I add the appropriate incense to my mortar and pestle before I begin, but there’s always a little left over from the last set of offerings. I have been offering a particular Yule blend since Kheimenia, for example, adding a bit more frankincense each morning since I’ve been giving that to Hestia. For the Deipnon I offer Hekate benzoin, and Poseidon gets myrrh on Thursdays, meaning it’s a heady mix right now. Despite the snow, I prefer to make particular devotions outside, and the scent hangs in the heavy, most, cold air like a fog bank on a mission. Since I got a new book recently, I selected a hymn from that to read aloud; I have not yet written a hymn to Hekate, but I know that I must. Yes, I’m stalling. Yes, it will be worth it when I’ve written my grand litany. I may be later than most, and perhaps my offerings are not entirely traditional, but I’d like to think that the stereotypical ancient Athenian would recognize what I was doing, and why. Perhaps the incense would smell vaguely familiar, or the fact that I poured an entire cup of unmixed wine onto the ground would strike a cord. Even if that Athenian would not have recognized it, however, I am confident that Hekate knew exactly what I was doing, and why. 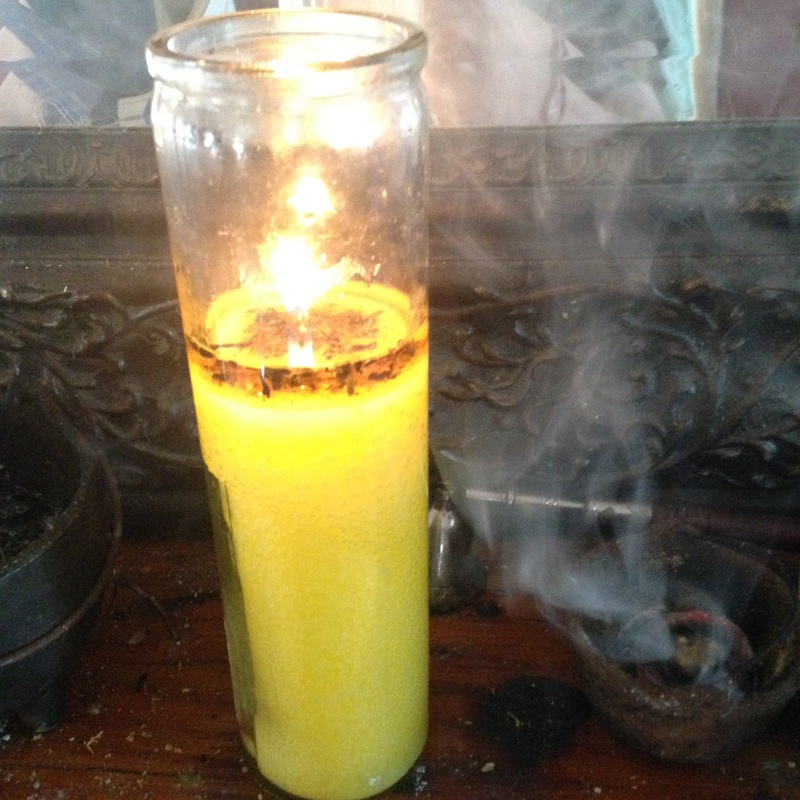 Deipnon is also a time for ancestor veneration, which including reading a portion of A Litany for the Many Dead as well as burning another incense blend entirely, lighting a candle, giving them water, and spirits, and tobacco. then, after they indicated that they were not entirely satisfied, I gave them more incense. Ancestors. They tell you what they want. One of the simplest ways to bring more money into one’s life is to take control of the money that is already there. To that end, I present the Pagan penny challenge as a means to do so in the coming year. Top of the jar is painted brown, to represent pennies; the ring around the lid has the same kerning as most American coins. I’ve practiced that type of prosperity magic for many years, and the result is paying for things with what amounts to free money. This coming year, I’ve decided to tap into the power of pennies. The idea is to set aside an increasing number of cents each day, starting with just one on the first of January. Each day after that the requirement goes up an additional cent: two cents on Jan. 2, a nickel on the 5th, dime on the tenth, all the way up to setting aside a full $3.65 on Dec. 31, 2017. That’s not even as much as what a lot of Americans spend on a single cup of coffee on the way to work. I can’t personally afford to drop five bucks on a fancy drink each day, but it’s still going to be a few months before I have even depleted the couches, change jars, and coins found while sweeping or just walking around. 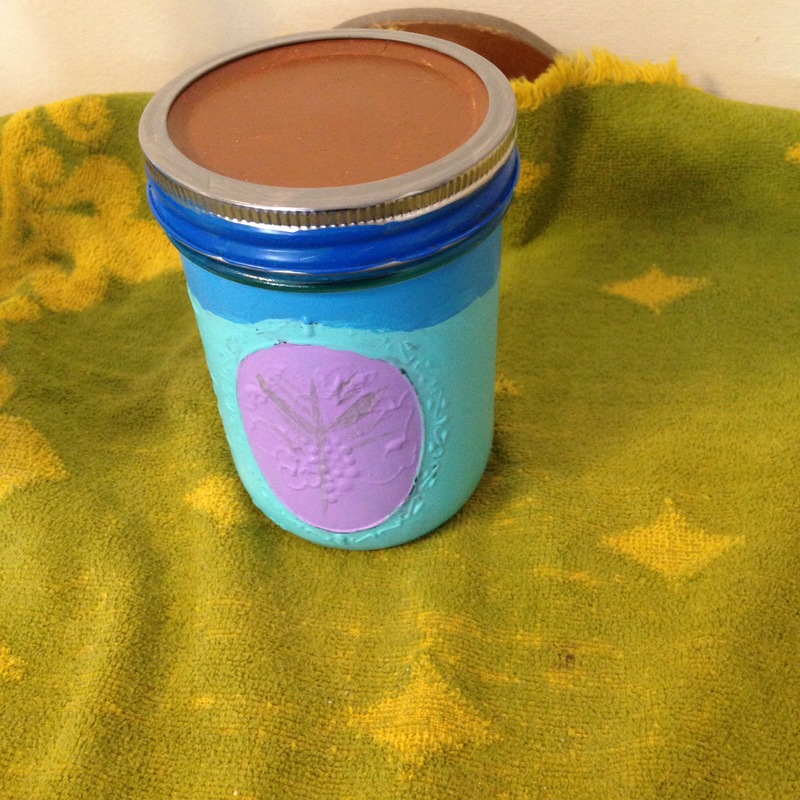 Bottom of the jar has the hint of a head in profile as on coins; several multi-level symbols are painted around the jar’s side. 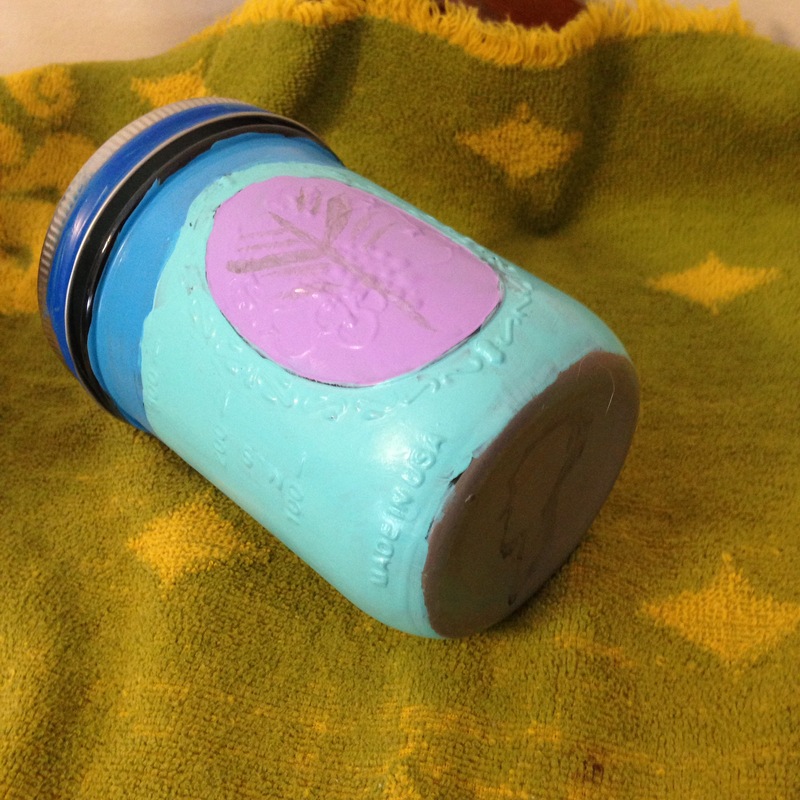 In an effort to be more intentional and crafty in my pursuits, I made myself a money jar for this purpose. I’m sure it won’t fit the entire amount if I leave it as pennies, but money-changing can itself be a magical act: swap coins intended for prosperity with an equal sum, and prosperity ends up on both sides of the equation. The dollar bills now in the jar are now part of the spell, and the pennies I removed don’t lose that essence unless “money laundering” means something other than what I’ve been led to believe. The Pagan penny challenge will yield $667.95 by the end of the year. If you expect it will be substantially in coin at that time, start planning now to find a coin-counting machine that won’t take some of your savings during the service. When they are found in the lobbies of banks and credit unions, they are generally free of charge to account holders. Finally, give some thought as to how this money should be used in your life. will it make you richer? Will it enrich you? Will it return to the couch from which is sprang? If the secret to magic is intent, then this is your chance to make a powerful spell. Don’t waste it. The winter solstice is when members of the Hellenic Temple of Apollon, Zeus and Pan celebrate the Kheimenia, which is a busy festival that tips the hat to an oodle or two of ancient and modern celebrations. We were unable to gather together and each of us was given the opportunity to celebrate separately. For me, setup began around noon and I’m just winding down now ten hours later. The Kheimenia includes elements of the Maimakteria, Pompaia, Poseidea, Haloa, rural Dionysia, and offerings to Pan of the pines, Selene, Apollon, and Helios. 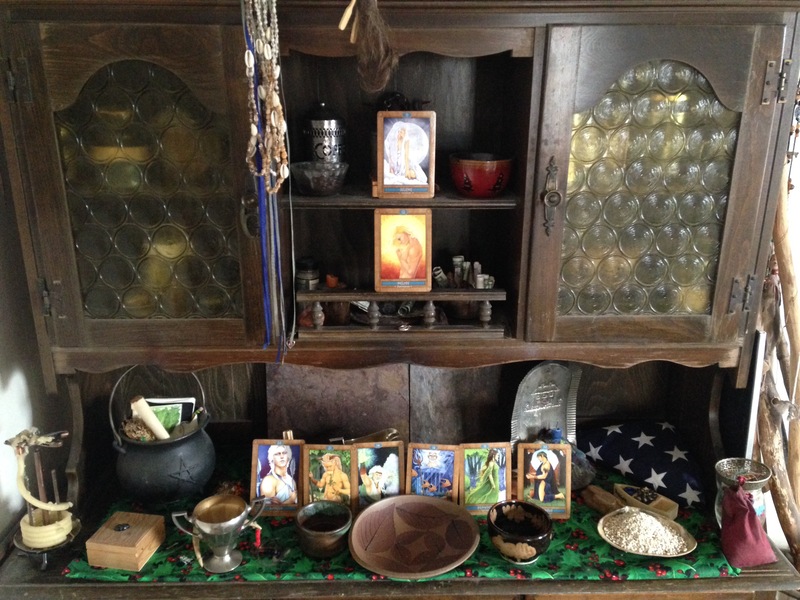 I was asked to set up images of all these gods, and my family’s main altar proved ideal when I decided to use cards from the Mythic Oracle deck to to so. Selene gets the place of honor for her prominence relative to Helios, whose image is just below hers; the other deities are displayed on the main level. This altar is against an interior wall which backs onto the chimney. That means processions — and any time I’m asked to circle the altar — I can, although it’s not obvious. 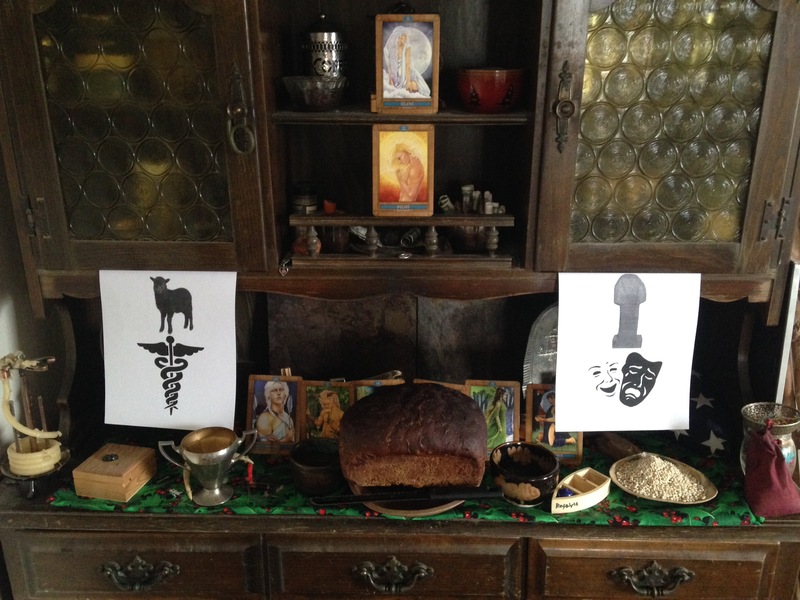 In addition to the deity images I printed out pictures of a black sheep and caduceus (left, for the Pompaia) as well as a phallus and theater masks (right, for the rural Dionysia) since I don’t currently have real versions of these items. I hope to eventually knit a black wool blanket to serve as the dion kodion, and at least get myself a wooden phallus, because one never knows when that might come in handy. 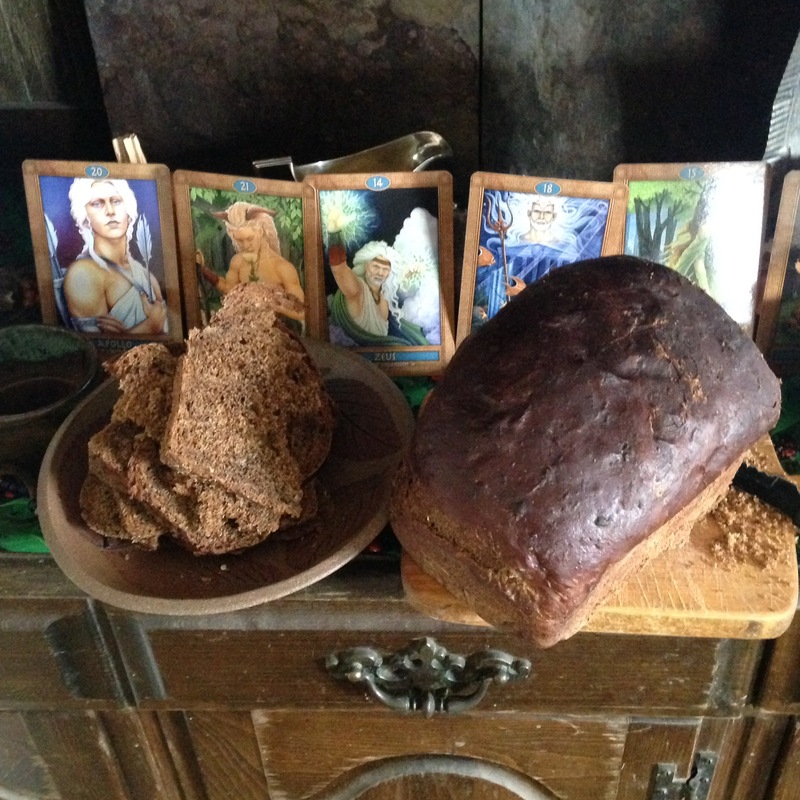 It’s a relatively large altar, but figuring out where to put everything proved challenging when I added in the sacrifice, a loaf of Nova Scotia brown bread which my wife baked from her family recipe. I also needed room for my kantharos and the wooden ship I used during the ritual of the blessing of the boats over the summer, honoring Poseidon. 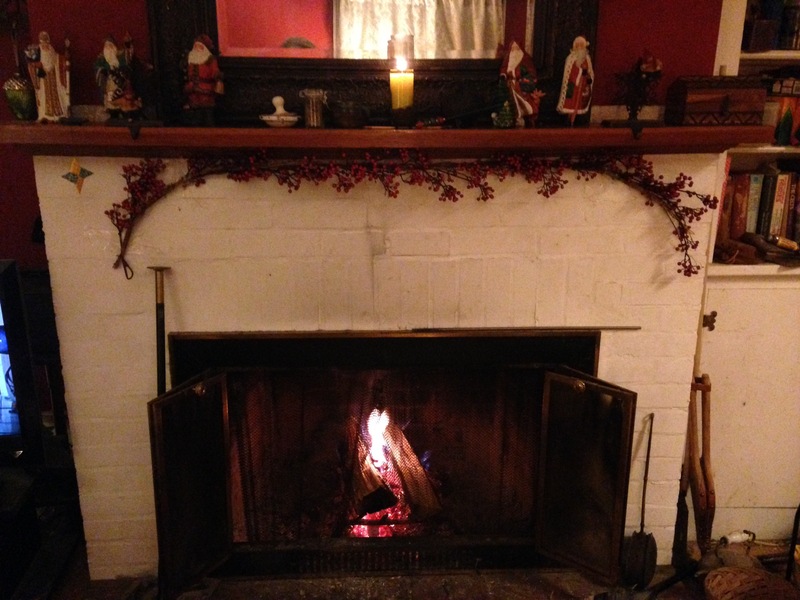 Hestia’s candle is on the mantle over the fireplace. 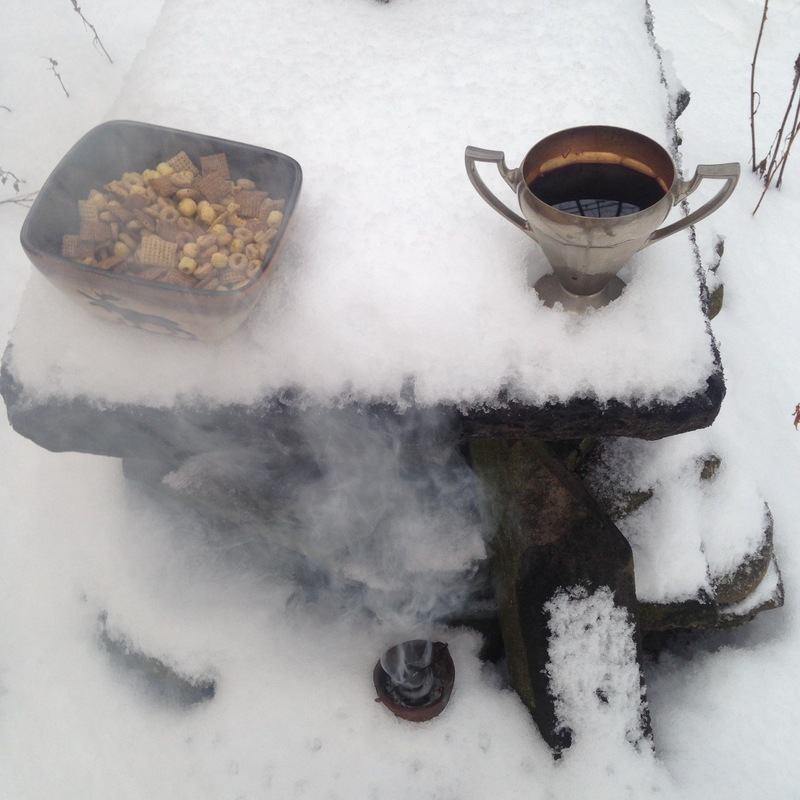 While the ritual script called for a prayer while lighting it, I kept it burning from when I made my morning offerings. 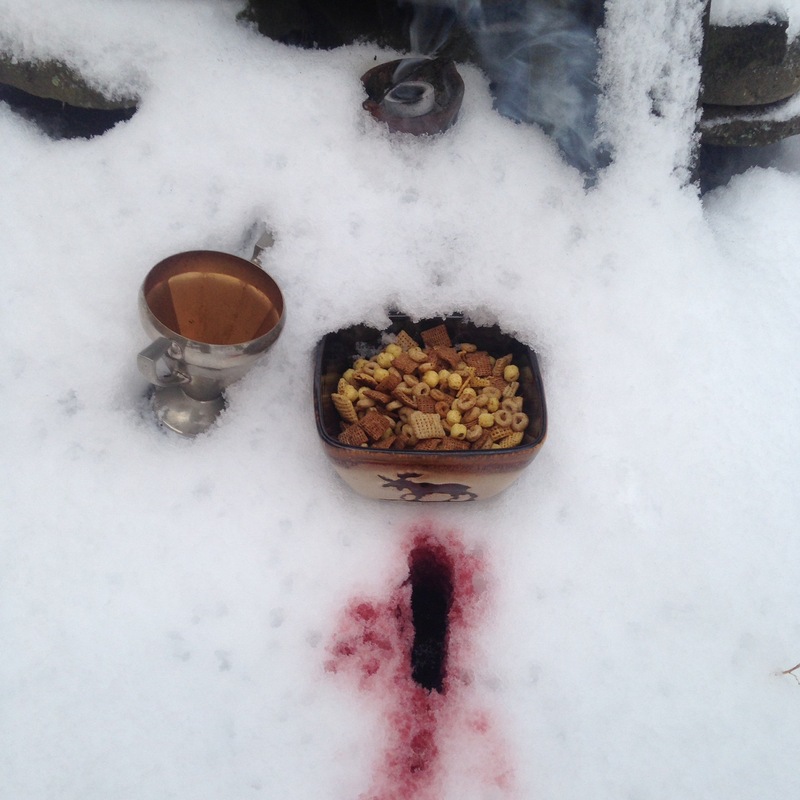 Instead, I gave her offerings of incense: a Yule blend prepared at my local metaphysical shop (where an astounding number of the products are made in-house), mixed with frankincense. After that, prayers were made to each of the gods of this festival. The challenge of making room was complicated when I realized I can’t make the sacrifice over the offering plate. Instead, I brought out the cutting board my wife made as a child. She was at work, but between that and the bread I felt she was adequately represented. Sacrifice, in our tradition, usually involves bread; I tend toward cookies when I’m alone but wanted to be more in sync with my temple-mates. We do not receive training in the complicated process of animal sacrifice, but we temple priests are taught how to execute a sacrifice of this type in the spiritual, as well as physical, sense. Each of the gods is given their due from the offering, which is then shared with the people. The sacrifice is preceded by petitions for the coming year, and this offering will feed family and visitors for many days. Thereafter was the reading of omens by performing divination using a method of my choice. I selected the Lymerian oracle combined with cards from the Olympus deck. I will not go into my interpretation, as this may hold messages for other people, but I found it to be full of hope and promise. Selene was offered white wine, but it was red for the other gods, alternating a libation for one of them, and a sip for me. I’m a cheap date, and it doesn’t take much to make me heady. 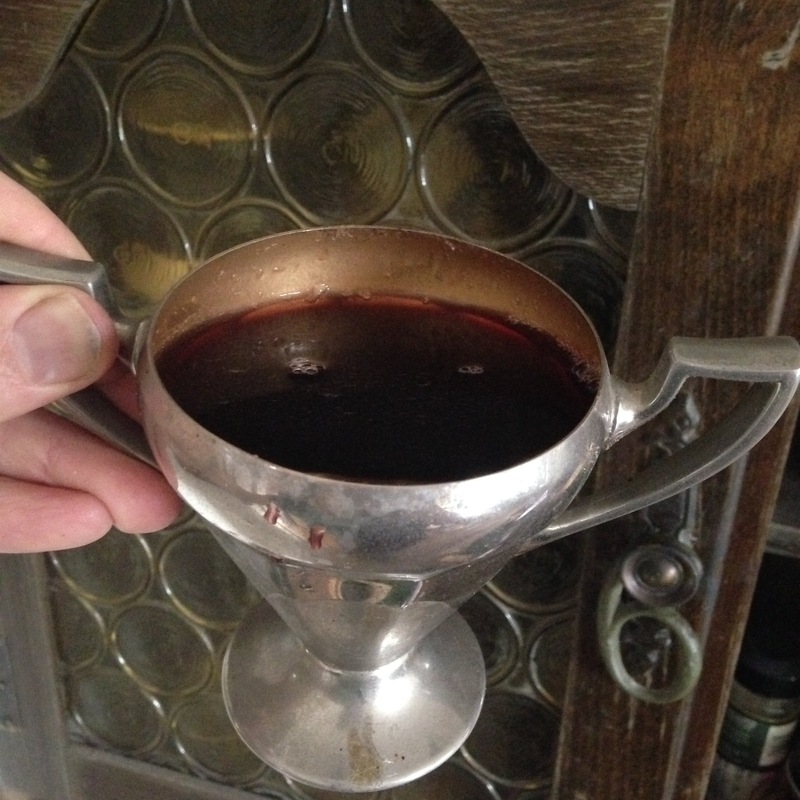 I’d hoped to measure it out for just two cupfuls of wine mixed with water for all the involved gods, plus the first one of white for Selene, but I ran out before I could pour out a libation to Dionysos. Apparently he wanted a full cup of his own. 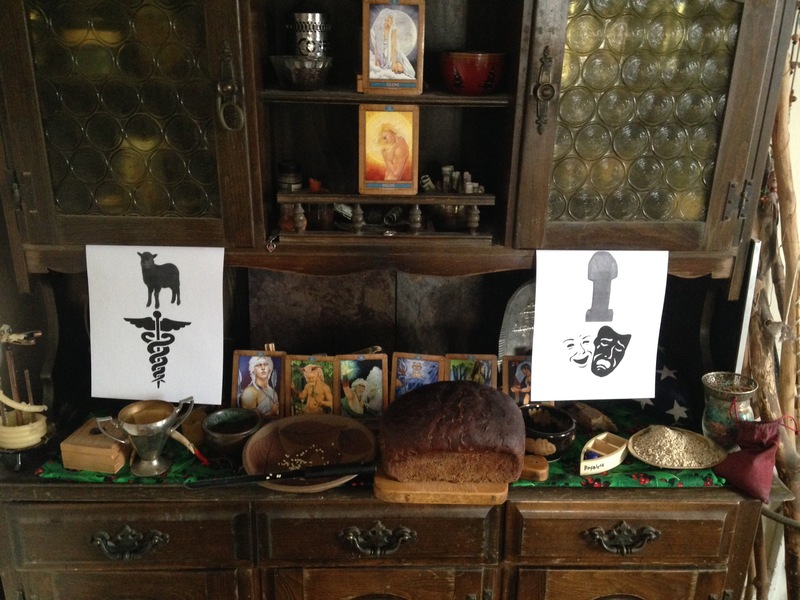 I circled the altar with images of caduceus and dion kodion while reciting prayers to blustery Zeus and Hermes the protector. 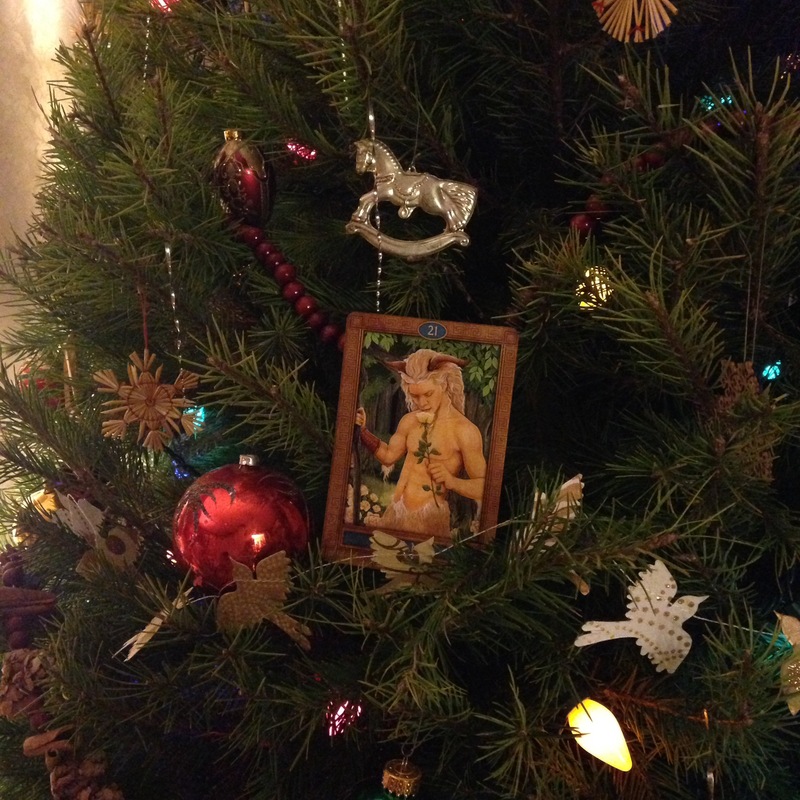 The prayer to Pan asked for protection as well as guidance how to live in these uncertain times, and dedicated the tree and its decorations to the Arcadian god. Before that process could begin, we inserted a family tradition of lighting the Yule log, cut from last year’s tree prior to offering it through fire or compost. (Last year’s, I believe, went to the community tree fire.) In honor of Dionysos, we watched White Christmas instead of a play. Decorations for the tree and hearth really came together wonderfully this year, and it’s always nice to include spirits of the season. More than any other time of year, the dark time is one that I feel all the various religious and cultural traditions I have honored throughout my life come together into a continuous spectrum of worship and celebration. 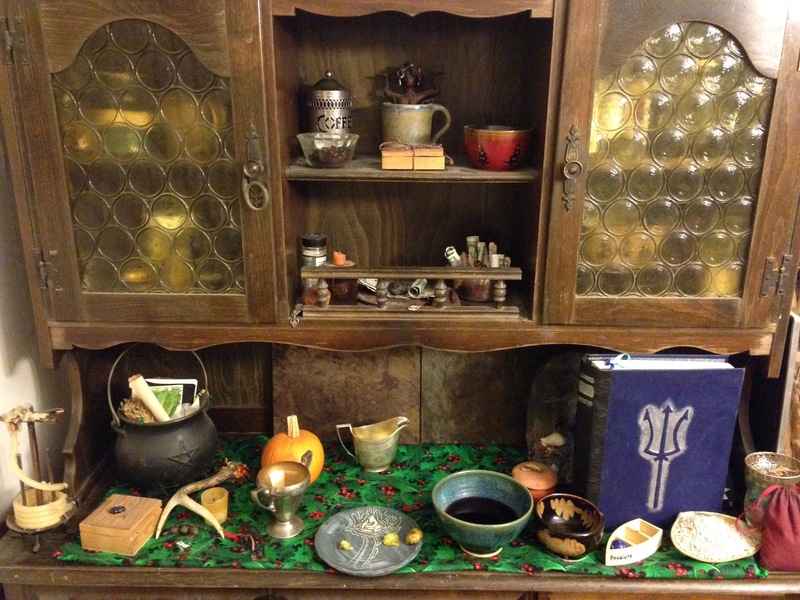 Somehow I managed to find space for my book of prayer and ritual on the altar among the various offering plates and bowls. It was easier after the deity images were removed at the end of the festival. Pan, though, is not going away quite yet. 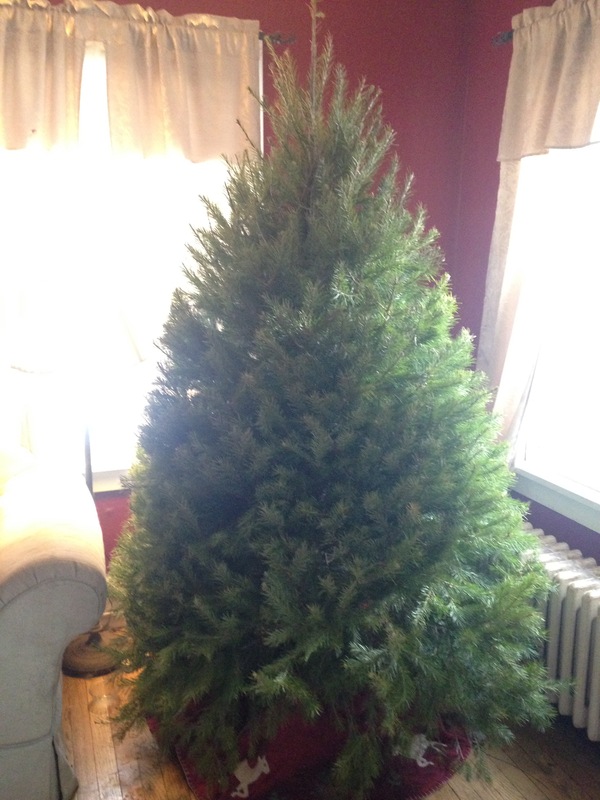 He gets to watch over his tree until the time comes to dispose of this glorious offering. 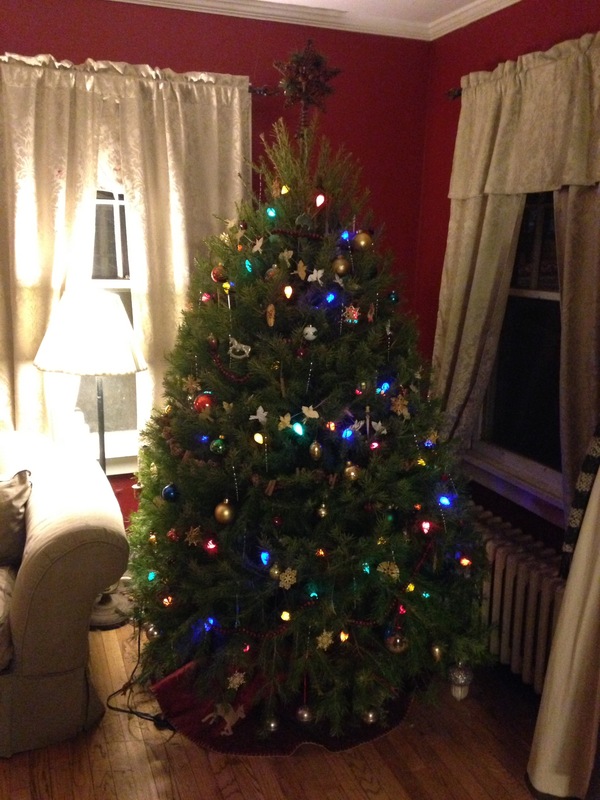 To me, a tree is no less significant than the sacrifice of an animal, and I hope that Pan feels the same way. No matter how you celebrate at this time of year, may you find just the right amount of light to balance out the dark times, or darkness to offset the light, if you happen to live south of the equator. I am touched by this lovely review. For what it’s worth, I didn’t make that connection about olives until I was actually writing. Poseidon just took me as his tool and said what he needed to.